Why do we see red poppies on Veteran’s Day and during events remembering our nation’s soldiers? While many older Americans recognize the delicate red flowers filling Flanders Field, our children and young parents may not know either the significance of those poppies or the value that one woman saw in distributing single red flowers. The Poppy Lady: Moina Belle Michael and Her Tribute to Veterans by Barbara Elizabeth Walsh seeks to change that. We recently had the opportunity to review The Poppy Lady with our two daughters and wanted to share it with our readers. Let us summarize The Poppy Lady. 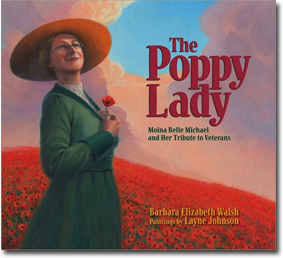 Barbara Walsh’s children’s book, The Poppy Lady takes us back in time to WWII and introduces us to Moina Belle Michael. Moina Belle Michael felt compelled to do something honoring the soldiers lost in the war--and those returning home. The Poppy Lady follows her efforts, which eventually led to her most well known work, handing out a red poppy to veterans of WWII and all of those wishing to respect and honor those serving their country. The Poppy Lady may not be the first book for which the kids reach. The Poppy Lady is intended for the 7-10 year old age range. However, the book is not written for self reading by most first or second graders or low level readers. The reading level leans toward upper elementary grades and the style lends to aloud reading and discussion. My daughters did not pick up The Poppy Lady as leisure reading--it is more of a detailed, historical biography than a “fun” book. My first grader reads at the fourth grade level and enjoyed it--my fourth grader did not enjoy it as much, but felt that it would be a good classroom library addition for Veteran’s Day or Memorial Day lesson themes. The Poppy Lady is a well written, educational children's book. I personally loved the book as it offered a fantastic conversation starter to topics such as community service, Veteran’s Day, military remembrance, civic duty, and even women’s history. I am sure that teachers could find tons of uses for The Poppy Lady during a variety of themed lesson plans throughout the year. What are our final thoughts on The Poppy Lady? I think homeschooling families and school and public libraries need The Poppy Lady in their library collections. So often the significance of well known tribute items, such as the red poppy, diminishes through time. This book would be a fabulous way to keep the tradition alive and remembered. Disclosure: I received a complimentary copy of The Poppy Lady for this review. As always all opinions are are my own and not influenced by the author or publisher. Thanks for this very nice review. I loved this book - both the text and the illustrations. The illustrations in this book are just gorgeous and a wonderful way to share Veterans day with our children. Thanks for sharing. I have to admit that I did know where poppies came from (Flanders Field) but that I seemed to have forgotten about the role Moina Belle Michael played as the catalyst for making the poppy the symbol for remembering our veterans. Sounds like a great educational read. Thanks so much for sharing it in the Kid Lit Blog Hop and I'm now a new follower. Cheers! What a wonderful book and a great review.